Entertaining should be easy and fun - even for the hostess! Here are 3 festive desserts that are no-fuss, make ahead, but still very tasty. This way, entertaining can be what it really should be about - fellowship with one another and making memories (...not stressful preparations)! If you can't tell from the all of the treats below, I took a (well deserved) break from unpacking yesterday... I think my hubby was confused as to why there were so many baked goods when he got home from work! The only unfortunate thing about all of these treats is that now that I'm working from home, I don't have any coworkers to bring them to. If there is one dessert that I love, it is chocolate covered strawberries... And I know there are a lot of haters out there, but I am most definitely a white chocolate kind of girl!! 1. Begin by washing and drying your strawberries and melting your white chocolate. 2. Once the chocolate is melted, dip 2/3s of the strawberry into the chocolate and let the excess run off. 3. 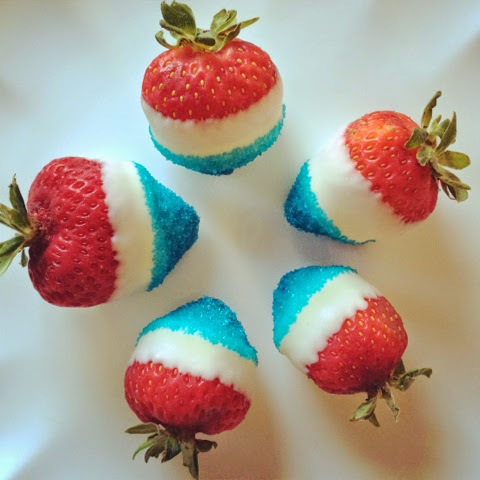 After the strawberry is done dripping chocolate, dip the lower 1/3 of the strawberry in blue sprinkles. 4. Let the chocolate harden and serve. This is a fun twist on fruit pizzas. Always a winner in my book! 1. 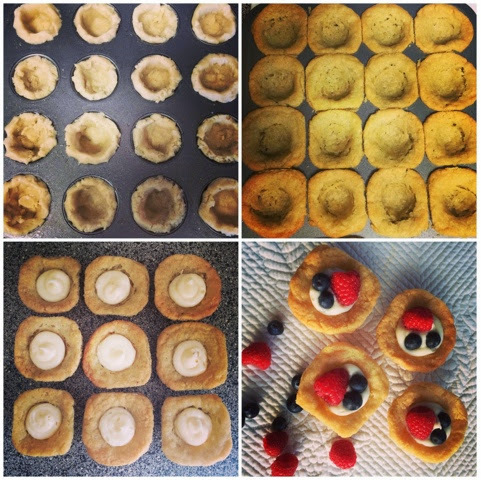 Spray a muffin tin with a non-stick spray and line with your sugarcookie dough. 2. Bake according to the package. When taking the cookies out of the oven, you may need to divide them if any ran together. 3. Once cooled, fill the cookie cup with cream cheese frosting. 4. Top with blueberries and raspberries and refrigerate for a few hours before serving. You can't go wrong with a good ole fashioned brownie. They are pretty much effortless to make, but always a fan favorite. And this 'Merica version is way too fun (and simple!). 1. Start by making the brownie batter as intended, and bake in a springform pan. 2. 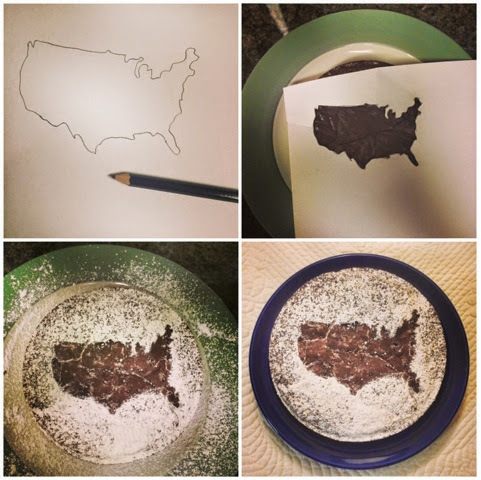 While the brownie is baking, sketch the outline of the United States. 3. Once the brownies are done baking and cooled, remove from the springform pan. 4. Cut out the shape of the USofA. If you want the shape in powdered sugar, then lay the outline on the brownie. If you want the outline in powdered sugar, then lay the shape on the brownie. Top with powdered sugar. Use a wet paper towel to clean up any edges of the outline. 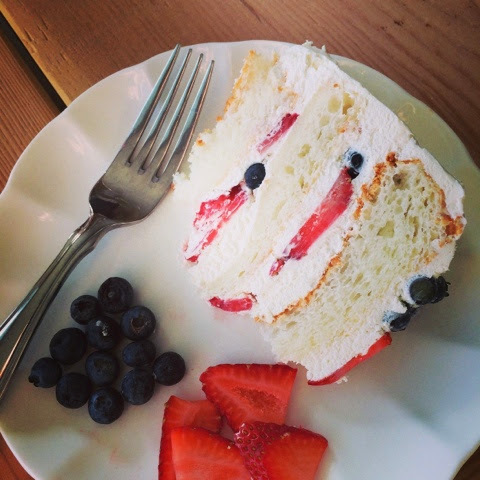 If you need another festive idea, check out my layered berry angel food cake! Linking up with the Tuesday's Table and Delicious Dish Tuesday. Those strawberries look so good! They really are the perfect summer dessert! Those strawberries are so cute! Love them! And the brownie thing is such a great idea! I'm pretty sure I could handle making those strawberries!! But I really want the brownie!! So cute! Love the strawberries, you can never go wrong with chocolate covered strawberries! 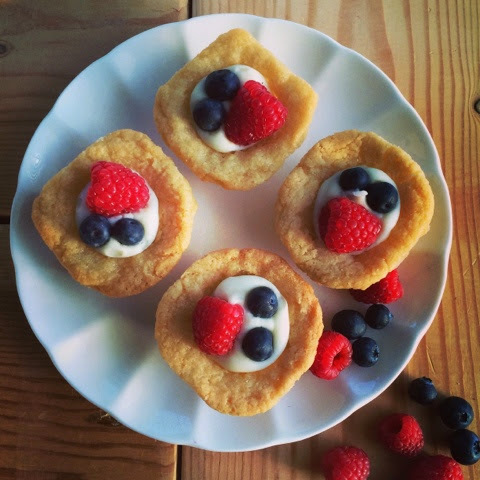 And the sugar cookie cups, adorable. Love all your baking creations, they are always beautiful! I told my mom about your angel food cake, and we're going to make it for 4th of July. So simple yet festive! Those cookies look so tasty! I mean when are you going to open up your specialty bakery because these all look amazing my favorite being those strawberry's how cute are they???? Mmm I love sugar cookie cups, and how creative is that brownie! I love these ideas!! I'm totally making those strawberries... yum!! WHAT??? that sugar America cake... never seen that before!!!! Love that USA brownie! However I would need a stencil... My cutting skills aren't that good! mmm can't go wrong with chocolate covered strawberries. 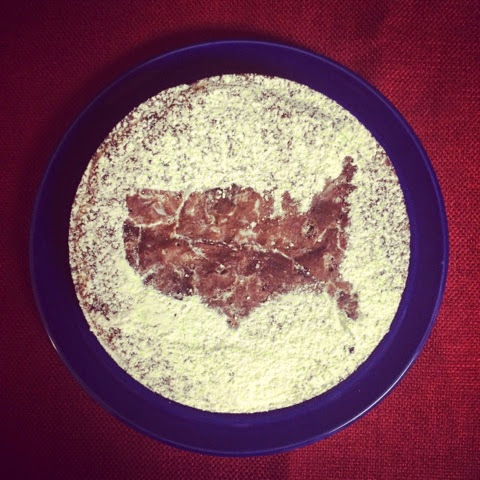 Love the usa brownie though, how clever. fun! I’ll take one of each please! The chocolate strawberries are my favorite. So good! Love all of these festive desserts!! 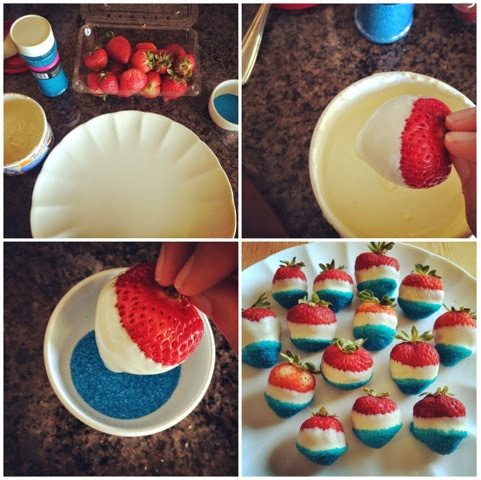 Those strawberries look so easy to do, might have to add that to the list this weekend! You've been busy!! I can't imagine having all of those treats in my house at once. I'd for sure gain 10 pounds, but it looks so good! Love the twist on the fruit pizzas! Get outta here with that USA brownie!!!!!!!!!!! These sound so yummy! I am ready for sweets now! Ooo those strawberries are SO stinkin' cute! Love these ideas! My boyfriend will love those cookie cups, and the USA brownie is just genius! These are so great AND easy!! I feel like I could pull them all off- thanks for sharing! WOW these look delicious! :) Just came across your blog and look forward to seeing more! yum cake i want that cake! Wow what a great list of options! I've been wanting to make those strawberries for to fourth of Julys but I just keep forgetting. I would mich rather prefer those with white chocolate too! And really all of the other ideas are fantastic too. I've never seen th before. Thanks for sharing at DDT! Next year maybe I'll be prepared to make these goodies. My mouth is watering -- EVERYTHING looks delicious! And your strawberries turned out perfect! That brownie with the USA on it is genius! I wish I would have done that. I'm definitely pinning it for next year! I've tried the strawberrys before and substituted the white chocolate for the marshmellow fluff stuff - because I could eat that by the spoonful. Anyways.. it was an e-p-i-c fail. Yours look so good! I need to just learn to follow directions.